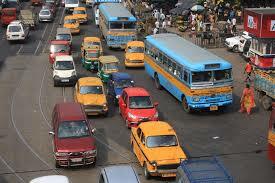 Dhaka is one of the fast growing metropolitan cities with a highly dense and increasing population in the world. Haphazard urban expansion with a minimum attention to the living environment has been the most common scenario here and existing transportation system has become hazardous for the entire city system due to its inherent transport as well as road network deficiencies. Although, the city mainly depends on road-based transportation system, the amount of road network is far apart from the minimum requirements. Only 9 percent of roadways and 6 percent of pavement area is available, in which 62 km functional primary and 108 km secondary and 221 km connector road serve the city transport service. It is evaluated that bus service plays the dominant role in providing public transport facilities but lack of proper land use and transport planning, uncontrolled development and due to post planning approach; about half of the area do not have the bus service facilities.